Dubai, United Arab Emirates, January 31, 2019: Pure Gold Jewellers, the award winning jewellery retailer, has created enchanting diamond pendants for Valentine's Day. The romantic collection features a double heart pendant held together by a solitaire diamond, and a key heart pendant set with exquisite diamonds. Moreover, customers receive a voucher worth AED 500 on purchase of any of the two pendants until 16th February, 2019. The classic heart pendant is an elegant design that a woman can wear everyday. Pure Gold Jewellers has given it a modern twist by featuring two hearts linked together by a solitaire, the symbol of a loving union. It is available for AED 1,399. 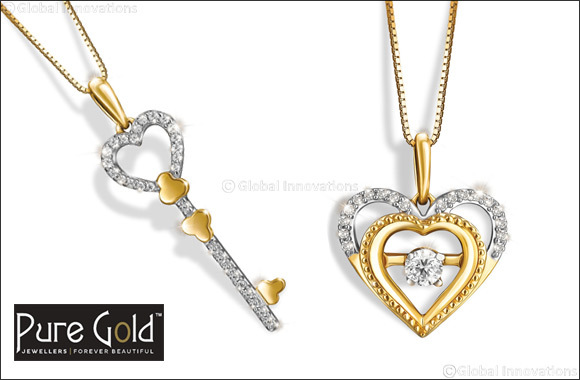 The simple, yet stylish shining heart key pendant represents the key to unlock the heart of one's loved one. It is available for AED 1,199.